This section of the Agas map of the mid 1560s has been colored to show the location of Fisher’s Folly, Oxford’s headquarters from 1580 to 1588, vis a vis Blackfriars on the Thames, where he first performed plays for the West End community (to the immediate left, not shown here), and Shoreditch, to the north along the Bishopsgate road, where Burbage built the first round wooden yearround successful commercial stage in 1576. The distance from Shoreditch to Blackfriars was roughly a mile. 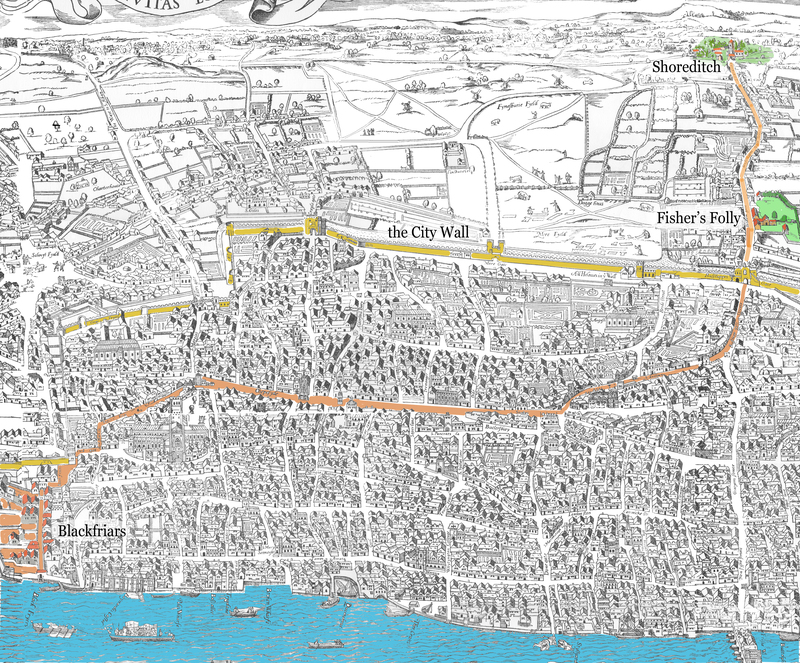 Yellow traces the City Wall, the boundary of Central London; brown shows the most direct and heavily travelled path between these two theaters with Oxford’s Folly in between. Only the most important buildings on this map are to be taken seriously. Since the map was created during the 1560s, neither of the theaters are shown, only the districts where they were created in 1576. Sorry, I know nothing about this and am in no position at the moment to do more research than what I’ve already done. What Wallace provides fits with previous and following accounts, and the history of the theater at Blackfriars rests on a number of works, not just on Wallace.